Learn more about how helicopters can benefit your agricultural operation. AG helicopters have been used to assist farmers in the agricultural industry for decades. With the precision of specialty spraying equipment and the ability to access areas that are difficult to reach using traditional (fixed-wing) crop dusting, helicopters can make a tremendous impact on your seasonal or annual crop yields and profits. What makes the use of helicopters for your farming needs beneficial isn’t just their efficiency in reaching difficult areas and spray control, helicopters can also save you money and penetrate the crop canopy deeper than any other method. Helicopters dispatched for agricultural operations can mitigate cost by eliminating the need to return to base for refilling, refueling and off-site mixing. When FairLifts arranges your helicopter spraying, the helicopter can arrive along with what is known as a nursing truck to refill spray tanks, refuel and even provide an easy to access mixing station. This saves you money on fuel cost you may be spending using a fixed wing aircraft. Helicopters fly by pushing air down and create lift using the spinning motion of their rotors and the pressure generated by what is known as downdraft. The air that is pushed towards the ground is done so at such a rate that allows for the spray they are applying to reach not only crop canopy but also down to the root of the plant and the undersides of leaves. This process guarantees that pesticides, fertilizers, and any additional solutions penetrate the furthest into the crop bed. When it comes to agriculture, helicopters prove to be the most versatile and effective means of taking care of your business which is why FairLifts provides easy access and arrangement of these services. We want to help you grow your profits, quality and quantity of product yields and we do that with a dedicated solutions team and a professional partnership with many of the pilots in your area as well as nationwide. When it comes to providing the best service at the best price, we consider ourselves your best option. If you farm, your crops are your major source of income and we treat each service individually and with the same care we treat our own business. FairLifts agents are experienced in the field of aerial agriculture and work with the basis of securing the best operator, pilot and aircraft for the job rather than handle all requests the same. This tailored attention provides you with the guarantee that the job will be done right, in a reasonable amount of time and at a price that can fit your budget. We don’t compromise quality for price in any of our operations and AG missions are no different. Many things make us your best choice for scheduling your helicopter service. Experts are standing by to get you a fast quote for your agricultural job! From crop surveys to dry and wet spraying, FairLifts can offer you more options for aerial applications. By using helicopters for your crop needs, you are choosing a more accurate, even coverage for your fields. Helicopters are much faster, have less of an impact on surrounding crops or roads, and provide more penetration of the crop canopy. With so many benefits as well as saving you time, gaining you profit and assisting in production of higher quality products, there is very little else to decide other than when you’d like for the pilot to come to your farm. Take a look at the options below, while these are the most popular we offer customized scheduling for specialized needs as well. In the years we have been providing helicopter services to those in the agricultural industry, we have made a vast amount of professional connections with operators nation and world wide. These professional connections allow for us to offer our clients an exclusive access to more services all in one place making scheduling multiple helicopter treatments convenient and easy with one phone call. As we have mentioned, we work alongside other professional operators who are experts in the field of aerial agriculture. These partnerships give us the ability to schedule the right aircraft for your need. If you are looking to complete simple aerial application, a smaller aircraft such as a Robinson R44 may do the trick, or if you are requiring a heavier lift to move equipment around on your property, a larger aircraft can be arranged. No matter the aircraft, your service will be completed quickly, efficiently and cost effectively. Many clients have told us the frustrations they face in finding service providers who know what they are talking about and treat them as individuals rather than a simple “job”. At FairLifts, we don’t cut corners when it comes to our clients. Every client is treated professionally, with respect and every job is handled as if it was the only job we are handling. Once you arrange your aerial application with us, you can call us back for additional services as needed and repeat services as well knowing you will be speaking to your personal agent rather than deal with many different people. Our support team can provide quotes, answers to your important questions and guidance based on your needs. Payments are easy with large and small projects. If you are requiring recurrent service and would like to pay per month we can arrange that or if you wish to pay for the entire time the service is needed up front, we can accept that as well. Payments can be made immediately and processed just as quickly so no worries about the processing time getting in the way of your AG helicopter service. FairLifts offers a wide assortment of services to those in the agriculture industry. From helicopter spraying to plot clearing, drying and equipment movement, no matter what service you require, we provide you with a one-call option to getting all of your needs met. Our agents are experienced in the field of aerial farming assistance and are ready to assist you seven days a week with any of the following services and more. Crop dusting for most, is often associated with airplanes and their dust trails over crop lands. In fact roughly 80% of all aerial application is done by fixed wing aircraft. However, the loss you may find in using this traditional method is not only in cost, but also quality of service. 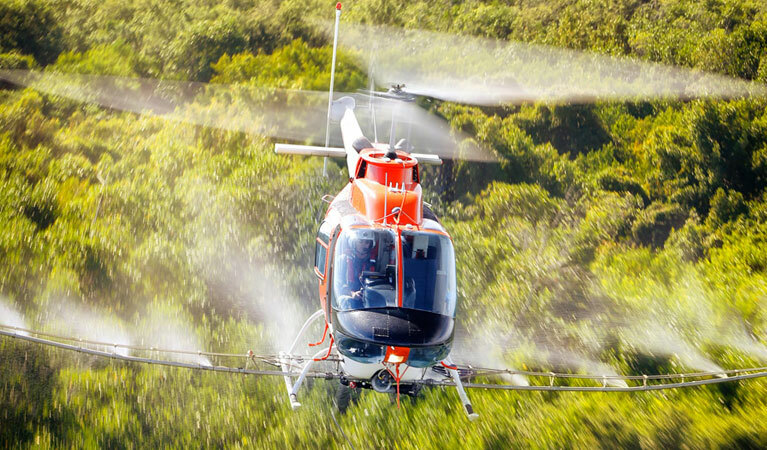 Helicopters offer a wider and more precise spray when it comes to aerial application and spraying. Spray can reach areas not accessible by planes as they may be close to wind generators or power lines and with the ability to push the chemicals through the canopy to the ground level, helicopter can also provide a deeper penetration ensuring all crops are covered. Helicopters offer spreading of fungicides to mitigate the impact they may have on your crops, spores such as rusts, mildews and blights can be effectively handled in a matter of minutes. Watering and providing aerial top dressing are also done quickly and efficiently. Dry and wet fertilizers can be spread using helicopters as well as a variety of slurry mixtures. Hydroseeding can also be applied and is completed using a drop-method similar to that of firefighting helicopters. A mixture of any of these services can be provided on-demand to fit your specific needs. At FairLifts, our ultimate goal is to assist you in increasing your end of season or annual yields, building the quality of crops you grow and increasing your overall revenue. Questions about the services we offer or are you looking for a free quote? Whether you live in an area prone to mosquito outbreaks or have another pest problem, handling the issue with the right tools and chemicals is crucial. Small insects and rodents can wreak havoc among fully grown and growing crop lines and the best line of defense is the application of both pesticides and rodenticides. Pest life-cycles from larvae to adults can often be missed by not knowing what kinds of chems to apply and area specific regulations regarding pesticide use can also be a problem if you are not experienced. 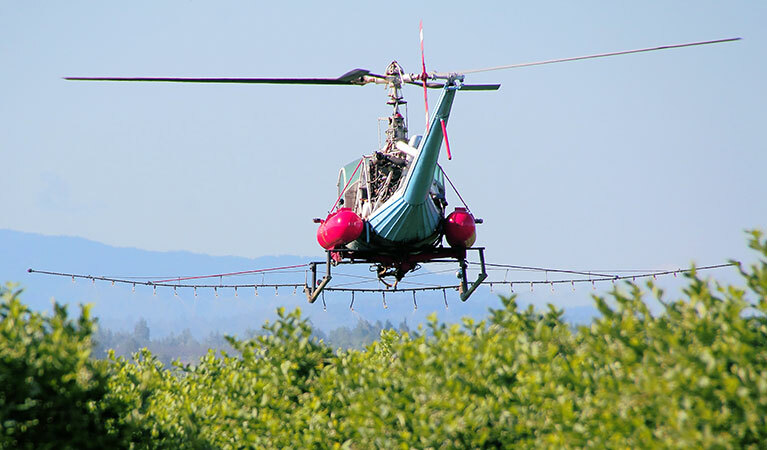 What helicopters can provide you is full coverage of public-safe pesticides, larvicides and adulticides and in a way that coincides with what is required by local governing agricultural entities. Often, pests such as fire ants will move their colony based on where you are spraying, however, with the use of helicopters, broadcasting is done effectively wiping out underground hives. Recurring flights can be scheduled and we highly recommend it, as pests will come back once the effects of the initial treatment wear off. Pesticide regulations are in effect to protect the ground water and air quality in areas treated with pesticides. In a effect known as “spray or pesticide drift” some of the chemicals may leak into groundwater deposits or become airborne. FairLifts partners with only experienced operators and individual pilots who know the regulations but also do not deviate from them to ensure the environmental impact of their spraying is widely lessened. One overlooked service helicopters can provide is that of weed control and brush control. When you have stubborn and noxious weeds encroaching on your crops herbicide application is mandatory. Outbreaks of weeds and other vegetation such as gorse, ragwort, thistles, broom, blackberry, scrub and buttercup can cause extreme damage to fully grown plants as well as affect pre-growth severely limiting plant potential. Helicopters provide even distribution of herbicides and also present a unique ability to reach down to top soil that traditional dusting methods simply do not. By pushing air towards the ground in an effect known as downdraft, the plant leaves will be gently jostled allowing for the spray to reach weeds that have grown underneath the crop canopy and might escape the eye of ground applicators. In areas that are remote or hard to reach, helicopters act as a precision tool to hit brush lines to quickly cover large areas all while mitigating environmental and public impact. Large areas can be treated at once and AG helicopters can provide much better coverage than even walking your rows yourself. Damage to crops due to freeze accounts for more economic losses than any other weather related hazard in the United States and it pays to be aware and prepare for a situation such as that no matter where you’re located. Frost can take some of those individuals in the agricultural industry by surprise such as when the big frost of 87’ in Arizona affected acres of crops overnight. The most important means of protection for your crops is prevention such as preset heaters along your row lines before the tail end of the grow season, but when this is not enough helicopters may be employed to come to your fields and provide assistance. Assistance by helicopter takes place prior to a known frost and includes a helicopter that will hover along crop rows pushing warm air down to crops with their rotors and displacing cooler air. Utilizing these downdrafts, a 60 acre field can be raised to a preferable temperature in a matter of 30 minutes or less. Additionally, drying may be needed after a frost to guarantee your topsoil is not frozen the following evening. Drying can also be provided after long term weather related over watering and flooding. If you are in need for a cleared space for more planting area, a helicopter can be arranged to assist you. From lifting dead trees to providing assistance with the herding of livestock, the versatility of an agricultural helicopter can utilized to provide you with quick and easy clearing. Take advantage of remote or hard to reach areas, gain more space by clearing out large trees, shrubs or move your livestock from one area to another the options are endless. When you need a heavy piece of machinery moved due to malfunction or otherwise, we can arrange for a heavy lift helicopter to come to your land to move it. Ground crew can also be provided for loading of the equipment using a long line and then unhooking the cargo at the drop location. If you are building a new silo or barn, we can offer the arrangement of a helicopter to hold beams in place or piece by piece work to allow for fastening each section. Our agents are available to speak with you seven days a week. We provide quick and easy scheduling for any of your AG needs, can answer any questions you have as well as can give you a free quote! Our team of agriculture experienced agents act as your support team for any of your ongoing or singular projects. Don’t speak to several people when you can have a dedicated agent available on-demand when you need it. Contact us now.